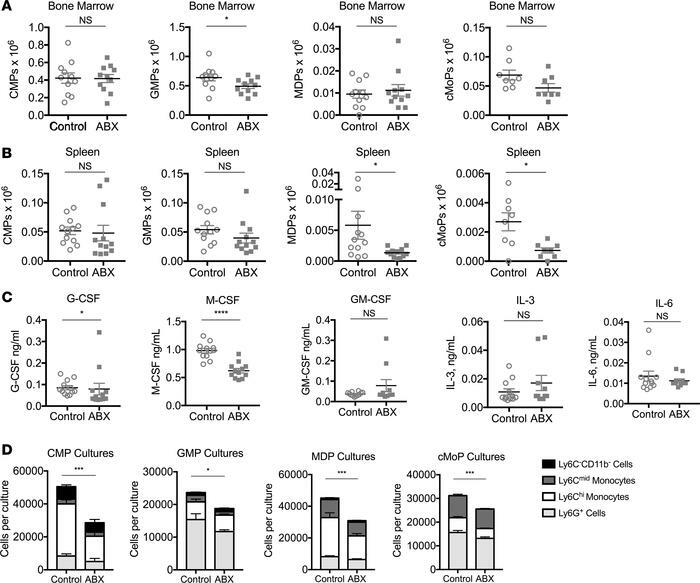 Basal myelopoiesis and myeloid progenitor cell function is altered in antibiotic-treated mice. Numbers of bone marrow (A) and spleen (B) myeloid progenitors were enumerated from mice that were treated with antibiotic (ABX) or control water for 3 weeks. (C) Baseline levels of serum myeloid-specifying cytokines were measured by ELISA from antibiotic-treated and control mice. (D) Myeloid progenitors were sorted from the bone marrow of antibiotic-treated and control mice and cultured in vitro for 7 days in media containing M-CSF, GM-CSF, IL-3, and SCF. Mature myeloid cells were enumerated by flow cytometry. Data from A–C are compiled from 3 independent experiments (n = 10–12 mice per group) and analyzed by the Mann-Whitney U test. Data from D are representative of 4 independent experiments (n = 4 mice per group) and analyzed by 2-way ANOVA (*P < 0.05, ***P < 0.001, ****P < 0.0001, antibiotic-treated vs. control mice).